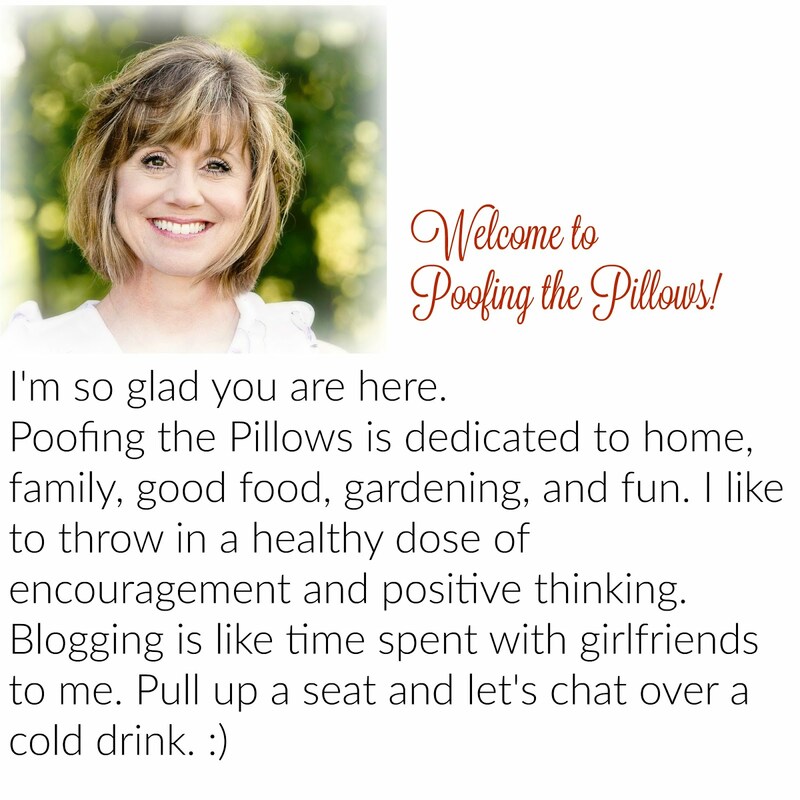 Blogging is alot like peeking in windows for those of us who love to decorate. Today I'm inviting you to peek into my bedroom window. I'm joining in with Debra at The Bungalow for a fun party featuring bedrooms. Remember last week when I was coveting the set at Pottery Barn? Well thanks to your encouragement and a little extra tutoring money, I just went right ahead and ordered it! Let me show you how this came together. I purchased the comforter, shams, and toss pillow. The toss pillow is really a cranberry red that is the same color in the flowers. It looks wrong in the picture today. The comforter is folded at the bottom of my matelasse bedspread. I am in love with these colors! I needed different curtains, of some sort, and wasn't sure what to get. Decided to get simple summery sheers that tie at the top. I already had the print that is above the bed hiding in a closet. The plates on the wall belonged to Mama Rose. Aren't the colors fresh and summery? The view out to the woods. I love it when the window is open and the sheers blow gently. My favorite bird nest and a sweet little picture of Spencer when he played Tball. I'm calling this my summer set and in the fall we'll bring the red toile back out. I'm so thrilled with how this all came together and I thank you for encouraging me to go for it! Oh, I am soooo jealous!! I try not to covet thy blog friends stuff but I can't help it. I've looked at our Pottery Barn at this comforter twice in the last week and I WANT IT!! The store display isn't near as nice as your bedroom. It's beautiful. Stacey...I am so thrilled that you bought the bedding from PB! It is gorgeous! I love the beautiful spring colors! It is perfection in your room! I think you need to give me your little nest...then it could be MY favorite;)! Can you tell I love it?! It is darling on the tray with the pic of your precious baby! You can never go wrong with Pottery Barn! It's beautiful! It kinda reminds me of the comforter set we had from Ralph Lauren. We had the set for years and years and we still have the valances hanging up. The comforter gave out not to long ago so we're in need of a new set. I'll have to check out PB! Oh, Stacy, I love it. It has just the perfect summery feel. I love a white matelasse. So fresh and it looks good with everything. Sweet picture of your Spencer. Love the change. I am going to do the plates on the wall thing in my kitchen. I'm collecting the plates now. Beautiful view. Absolutely beautiful. Very cheerful and summery. Your bedroom is indeed all dressed for summer. I love the look of white matelasse under your pretty new comforter. The white platter with the nest and picture of Spencer is a nice touch on the white platter. Thanks for joining in and linking up! Very springy...I really like the birds nest/flower arrangement...did you make it? Absolutely gorgeous Stacey. Like WOW gorgeous! It's funny though, in the first picture the walls look like they are a pink color and then in the other pictures they look pale yellow. Either way, the room is stunning. I just love everything. And those built-ins! Never saw anything like that in a bedroom - you are SO lucky!!! xoxo and thanks for encouraging me to join the party! One of my weaknesses is bedding. I love to buy it! Something tells me you deserved this new set. It is nice. Your bedroom is so pretty. Love the new comforter set. It does look very fresh and summery. The nest next to your son's picture is such a cute little vignette. I also LOVE your little built in bookcase. So cozy. I love it!! That print is so pretty..I've seen it in person before Easter and I was drawn to it immediately because of the rich colors. The shade of blue is so pretty and those flowers are gorgeous. Your bedroom looks fantastic and all ready for your company! So glad you splurged on such a beautiful ensemble! You deserve it! P.S. I love the nest and picture of Spencer!! Being a Mom of 3 boys...I should dig out some of the many sports pictures I have and display them more prominently ..thanks for the idea! Stacey, I love that new set! You're so right, it is totally summery and the colors are gorgeous. I love matelasse's cause they are so versatile, you can put anything with them. Great job on putting it all together. O, Stacey..I LOVE your beautiful new bedding. It all looks just wonderful. I, too, am putting sheers in my bedroom...they look so pretty in yours. Thanks for playing today so we could see your pretty room.. This is a beautiful, relaxing, inviting and so color coordinated bedroom. The soft sheers at the window and the soft colors of the comforter and pillows show your decorating skills perfectly. The nest and the picture look so good in the room. Well done my friend! I'm lovin' this new summer set...great colors! thanks for sharing your beautiful room with all of us. What a beautiful set, Stacey! If you love the way the sheers blow when the window is open, I think you've got your answer on the window treatments! : ) I'd definitely leave them then. I love that built-in bookcase in the corner. OOOOOhhhhhh, AAhhhhhhh.....love it, Stacey!!! it is so warm and inviting! Very pretty, Stacey!!! Like falling asleep in the grass, surrounded by roses. Beautiful new bedding. Love the colors and it looks awesome in your room. Glad you could splurge and get the set you wanted. PB bedding last forever. Worth the cost. I have it in every bedroom. WOW!!! Good for you, looks so pretty. Yes! The colors are fresh and summery! I love them! I love aqua and red and white together! Your room looks like a bed and breakfast. Oh Stacey, I'm so glad you "went for it"!!!! It looks BEAUTIFUL and I too LOVE those colors! It is just a gorgeous bedroom. Stacey, glad you treated yourself to the bedding. It is lovely....so filled with life! I too love your new comforter & shams. They are fabulous. Thanks for sharing your bedroom. This has been very fun. What a very pretty bedroom, Stacey! Love the colors you chose! Love it! It looks so fresh and pretty! Thats a great set! I need to finish up our bedroom. Hi Stacey! Oh, your bedroom is lovely. Love your linens and I see plates on the wall! Love it. It is a beautiful print and the colors are perfect! I love your bedroom! I would love to copy it exactly in my bedroom! Beautiful!!! just absolutely gorgeous!! love the shabby chicness of it!! It is absolutely beautiful! So glad that you were able to get it! Hi Stacey, well, I'm in love with your bedroom! The comforter and shams are gorgeous, you're inspiring me to find something new, I've been putting it off, but your room looks so so springy. I just love it! Love the comforter. I need to spruce up our master bedroom room soon! Your new comforter set is so bright and cheery! I love big, bold flowers! Hi Stacey, Love, love the comforter set. I have also seen this in Pottery barn and thought it was divine! The white curtains and platters on the wall are perfect. Thanks for entering my giveaway and the sweet note you left. I got the Butter Slab a couple of years ago online at Ruby Lane. Also Cote De Texas sells something similar on her blog. Just look on the left sidebar. I hope you find one, I love mine.